The vague medical term shin splints has largely been replaced by the more accurate term medial tibia stress syndrome or MTSS but many athletes still use the older term. Shin splints are a painful condition in which the bone tissue and thin membranes of the lower shin bone become inflamed. The most common causes of shin splints are over exercising, biomechanical abnormalities and poor footwear. Shin splints / MTSS is one of the most common injuries reported by runners and professional athletes. Shin splints starts with pain along the front or inside edge of the shinbone (tibia) is commonly referred to as shin splints. The problem is common in athletes who run and jump. Shin splints is usually caused by doing too much, too quickly. The runner with shin splints typically reports a recent change in training, such as increasing the usual pace, adding distance, or changing running surfaces. People who haven’t run for a while are especially prone to shin splints after they first get started, especially when they run downhill. Shin splints on the front of the tibia are called anterior shin splints. Posterior shin splints cause pain along the inside edge of the lower leg. 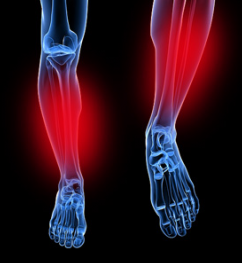 Bone shin splints cause general pain in the lower leg.